A comprehensive guide to statistics-with information on collecting, measuring, analyzing, and presenting statistical data-continuing the popular 101 series. Data is everywhere. In the age of the internet and social media, we're responsible for consuming, evaluating, and analyzing... read full description below. A comprehensive guide to statistics-with information on collecting, measuring, analyzing, and presenting statistical data-continuing the popular 101 series. Data is everywhere. In the age of the internet and social media, we're responsible for consuming, evaluating, and analyzing data on a daily basis. From understanding the percentage probability that it will rain later today, to evaluating your risk of a health problem, or the fluctuations in the stock market, statistics impact our lives in a variety of ways, and are vital to a variety of careers and fields of practice. 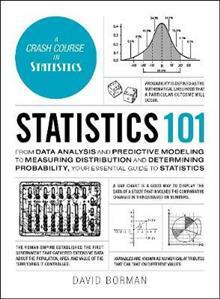 Unfortunately, most statistics text books just make us want to take a snooze, but with Statistics 101, you'll learn the basics of statistics in a way that is both easy-to-understand and apply. From learning the theory of probability and different kinds of distribution concepts, to identifying data patterns and graphing and presenting precise findings, this essential guide can help turn statistical math from scary and complicated, to easy and fun. Whether you are a student looking to supplement your learning, a worker hoping to better understand how statistics works for your job, or a lifelong learner looking to improve your grasp of the world, Statistics 101 has you covered. David Borman has been involved in the financial markets and trading since 1999. He has professionally worked at Deutsche Bank, Merrill Lynch, TCM Custom House, Morgan Stanley, and Phillip Capital. He has been exposed to the trading and day trading of mutual funds, stocks, ETFs, Leveraged ETFs, Commodities, and Derivatives. He has worked right alongside the Risk Management Desk of a Singapore Based Futures Commission Merchant, where fifty million dollar margin calls were a daily occurrence. Within his own account, he has traded extensively using ETFs, precious metals, and currencies. He holds a BS in finance from Southern Illinois University, and a masters in accounting from DePaul University, and is working on his PhD in financial management from Northcentral University. When not trading, David finds the time shop for treasures at local antique shops. He is the author of Day Trading 101.